Perhaps the best deal going in the world of V8 performance is the Chevrolet Motorsports 350/290. It’s sold as a basic crate engine with no intake manifold or carb, no exhaust system, or ignition – not even plug wires. To further keep costs down, all the items you’d expected to see chromed on a typical crate motor are painted black on the 350/290. That’s because Chevrolet Performance wanted to keep the price as low as possible, you can buy the engine for less than $2400 and many sellers will ship it to your home, work, or shop for free. Spectre Performance can help. The company offers a full line of the type of chromed steel and polished aluminum covers and components the 350/290 is screaming for. And if you bolt them all on before you drop the motor in your pre-1976 vehicle, the installation will be that much easier. But back to the motor for a second. It’s named the 350/290. The first number is pretty obvious – the engine’s displacement. The second number is the horsepower as rated by GM. There are sellers out there who claim that if you carefully select your intake, exhaust, and ignition components 300 horsepower or maybe even a little more is available. 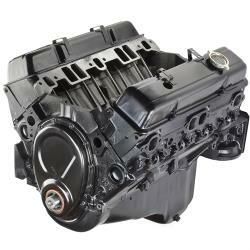 The motor is built on fresh GM block and heads, no recycled parts here. The crankshaft is cast of nodular iron and held in place by four-bolt main caps. The rods are the latest powered metal fabrications, just like in the modern LS engines. Cast aluminum pistons, hydraulic cam, and cast iron heads with 76cc combustion chambers top off the valvetrain. So you’ve placed your order for the motor and the delivery arrived shortly thereafter. The black beast is now bolted to your engine stand where you can install the intake manifold, carburetor, and ignition system. It may have plenty of go at this point but it lacks seriously in flash. Spectre makes things convenient for the engine builder by combining several complementary parts together in a package. This way you’re certain all the pieces will fit and you’ll save a little dough in the process. 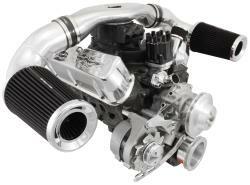 Spectre’s 5432 Deluxe Engine Kit provides parts that both increase the look of your 350 engine. This complete kit includes a cleaner stud kit, a cleaner nut, valve cover hold-downs, an oil cap, and a grommet kit to give a slick chrome look. A red performance air cleaner, breather, and a PCV breather are also included. This kit is designed to fit Chevrolet center bolt engines. The Spectre 5432 Deluxe Engine Kit includes a Spectre low-restriction, washable oiled synthetic air filter element that helps increase horsepower and torque, along with an Extraflow filter lid. If you’re planning on installing the later style long water pump, here are a few items to add to your shopping list. The Spectre 47293 Alternator Bracket Set was designed for Chevrolet Small Block engines with a long water pump. This triple chrome-plated kit includes two brackets and the hardware needed to mount your alternator in a clean and professional way. We like the look of the Spectre 4930 as not only is it made from polished aluminum, but it also swivels 360 degrees. This means that not matter where you have to route the upper coolant hose, it’ll always end up in the right spot. We also prefer the style of the 4930 over the typical ball and socket look. Just to make sure all the flash isn’t just fastened to your engine, consider an item like the chrome plated double-o ring 43385 radiator cap. There’s a matching power steering dipstick to go with it , part number 17985. That brand new motor deserves better than a discolored old plastic overflow tank. Spectre has several different sizes in both height and diameter. We like the 4192 as it’s easy to fit just about anywhere. If this 350/290 is headed for an older Camaro, Chevelle, or Chevy pickup, check out the line of radiator support panels available from Spectre. Not only do they brighten your engine bay, the help the radiator run cooler as well by directing more air through the radiator as opposed to around it. Spectre carries several items that’ll upgrade the appearance and performance of your engine’s oiling system as well. Replace that black-painted stamped-steel oil pan with a gorgeous finned polished aluminum pan from Spectre. We like 4988, which accommodates the 350/290 two-piece rear seal, but also provides a little extra engine cooling thanks to its aluminum construction and “heat sink” fin design. While you’re at it, throw in a plated dipstick like the Spectre 5730 and get rid of that yellow plastic ring. Our last stop is the front of the motor. 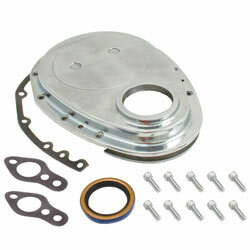 We like the looks of the 4935 timing chain cover and its ultra-sleek partner, the 4936 pointer. But let’s face it. Anything would look better than the black-painted, stamped steel cover shipped with the motor. As we don’t know what ancillaries you’ll be installing on the motor, we can point you to the Chevrolet small block long pump pulleys page, where options range from single to multiple belt configurations. So imagine a fresh new 300 horsepower 350 CID small block Chevy engine powering your ride, with thanks to Spectre for making it look as good as it goes. Since 1983, Spectre has designed and offered unique and innovative parts and components to fuel your vehicular obsession. Our products are designed and tested to perform and last. We have a state of the art chassis dynamometer with diagnostic and emissions testing and performance optimizing capabilities, as well as a top of the line Super-Flow flow bench with airflow, pressure, and velocity measuring capabilities in both intake and exhaust modes, as well as a full experimental laboratory, all of which are used to develop quality products that perform.